The trip was great — everything went well and we got to see tons of interesting things. I think the highlight for us was visiting the Eames House. 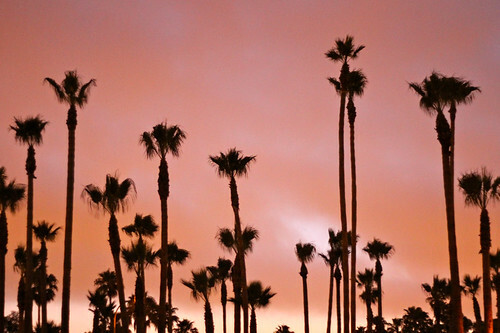 It was surreal to see it after having looked at so many photos and trying to visualize it. It was a beautiful day, we were the only ones there, and it was really peaceful and fun (if hard to find). They basically gave us the run of the grounds for as long as we wanted, we just couldn’t go inside. We also saw Jim Gaffigan do a live show, and visited a few gastropubs and other incredible restaurants. We snorkeled on Catalina Island in 65 degree water which was a pretty crazy experience. Finally, we left Dustin’s camera (Lumix LX3) in the glove box of the rental car. I called them hurriedly from the plane as soon as we realized we’d left it, and they actually found it and offered to mail it to me – whew. 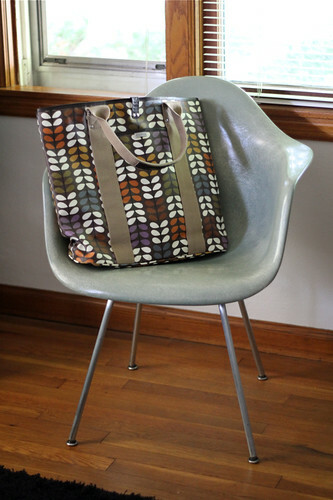 Meet my new Orla Kiely bag that just arrived today — its maiden voyage is tomorrow when we start our summer vacation. I’m finally visiting my brother in LA. This will be my second trip there and Dustin’s first; I went once in 2005 during the Christmas season when things can actually get rainy and dreary. We’re really excited, it’s been a while since we’ve traveled. We’ll be seeing Jim Gaffigan live and otherwise seeing and eating and touring everything we can, including the grounds of the Eames House (of course). 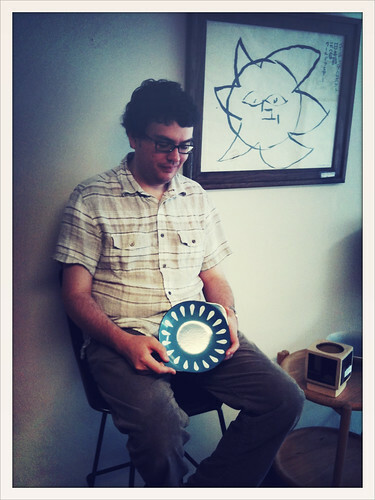 Here’s Dustin holding my first Catherine Holm piece today. We found this in the back of our local mid-century furniture/object store — which we also recently found out is moving out of town. Gah! At least we found this first.